That self-portrait by Joni Mitchell for her album Both Sides Now has to be some of the best cover art ever. I was moved to post it by reading Katherine Monk's Joni: The Creative Odyssey of Joni Mitchell. Also on Facebook and Twitter. No feebies involved in this post. Any copyrighted material on these pages is included as "fair use", for the purpose of study, review or critical analysis only, and will be removed at the request of copyright owner(s). A little Hopper influence, perhaps? Elaine, Norman Perryman has also commented on the Hopper influence, but over on Facebook. So how is the biography? 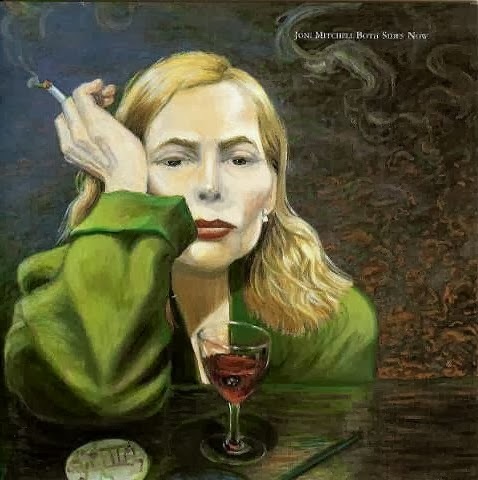 Joni Mitchell's music is aging extraordinarily well, and she has one of the most interesting careers in pop music history. It is not really a biography Michael, more armslength psychoanalysis. It is one of my very favourite albums... in fact, I was listening to it when you posted this.